It should be apparent from just this photo that these Wilton Drill Press Vises are not you big store value-breakers! These are tools that work as designed for lifetimes. The best way to do serious harm to yourself or anyone in the vicinity of a drill press is to try boring holes in something that is not locked in place. There are drill press vises at the big box stores with that level of pricing but they are not meant for serious use and can actually make drilling operations more dangerous if not used within their design environment. 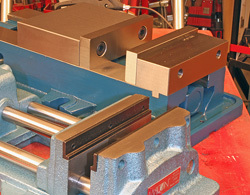 The vises from Wilton in this review are designed and built from the ground up to be used on drill presses and other machines in full-on shop and industrial environments. They have lots of mass, heavy-duty flanges for securing them to the machine and jaw pressure capabilities that insure that what you clamp in them stays there. Yes they cost more but their price is still a fraction of even a quick visit to an emergency room or doctor. 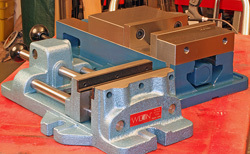 The Wilton 1275N Vise has a jaw width of 6 " and an open capacity of 7½ ". At 6.7”-tall, 10.7”-wide and 19.7”-long it’s not unexpected that the Wilton 1275N Vise weighs 75 ¼-lbs. It features a ductile alloy body and a flame-hardened bed to insure precision and durability under the demands of even busy shops. The Wilton 1275N Vise also has coolant troughs for those types of operations. The jaw designs (left) between these two Wilton Vises varies considerably because they were designed to perform different levels of work. Both of these vises are capable of holding work securely or crushing some of it (right) if you try just a little. The fixed jaw is annealed and carries an 85,000-PSI rating. 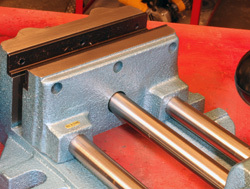 The sliding jaw comes in at 70,000 PSI, is also annealed and is surface ground to insure a secure grip when you need something to stay put during machining or hand work. Both jaws are backed by oversized steel blocks that substantially increase their stability and mass. To make the Wilton 1275N Vise dependable the clamping screw is fully enclosed around the moveable jaw to keep it debris free. The screw is made from high-end alloy steel that is hardened and precisely ground to keep it operating like new for years. The 9”-long handle has a large hex socket that fits over the jaw-adjusting shaft. After adjusting the jaw the wrench is removed and set aside so it does not interfere with machine or even some hand operations. The Wilton #1206 has 6"-wide jaws and a maximum jaw opening of 6-3/16". The jaw faces are 1-13/16"-deep to make gripping even larger stock or parts easier and more secure. The low profile 18.9”-long by 11”-wide and 6.3”-overall height and an overall weight of 35.4-lbs. make the Wilton #1206 compatible with many home and pro shop applications on and off of machining centers. The base has an open design below the jaws to accommodate through drilling operations. The jaw is positioned with a simple push/pull bar terminated with a comfortable ball-type handle. A simple locking lever cams the jaw 3/32” towards the closed position and is capable of generating holding pressure between 400 and 1100-lbs. The same locking lever makes swapping out similarly sized parts very fast when production as well as security is important. 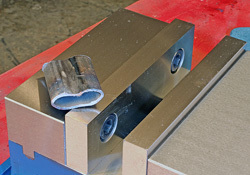 The manufacturing on both of these vises is first rate from ultra clean ductile iron castings (left) to the finely ground steel shafts (right) that control the path of the jaws. Everything is done right so they work right in the shop! Both of the Wilton Drill Press Vises have massive mounting lugs that allow securing them for both accuracy and operator safety. Both vises have heavy ductile iron bases that resist flex under pressure and can live in the metalworking world long-term without cracking. Both of the Wilton Drill Press Vises show a combination of designed-in ruggedness and precision manufacturing that we just don’t see very often anymore. These vises lack the often useless “fluff features” that often just get in the way. However, they are long on the power and ease of use needed to help you be productive and safe. While the jaws on both Wilton Drill Press Vises are capable of applying tremendous clamping pressures they are easily controlled so you don’t squish more delicate pieces that just need to be held securely. The cam lever on the Wilton #1206 makes it easy to apply the right amount of pressure. The larger 1275N has a long arm handle that lets you apply a bunch of pressure or just a little. 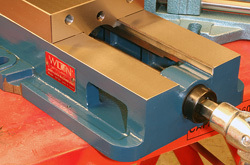 While the Wilton Drill Press Vises are rather simple machines in todays’ computerized everything world, their design and manufacturing makes them very effective and easy to use. The steel shafts that guide the jaws are precisely ground to allow the jaws to move smoothly which makes it easier for you to operate them. If there is a flaw in the design or manufacture of the Wilton Drill Press Vises I can’t find it. Throughout the evaluation I found both of the Wilton Drill Press Vises to be very easy to use. Clamping stock securely is a virtual no effort deal and with a little common sense whatever you clamp in these vises is not coming out until you want it to. I know that the Wilton Drill Press Vises come with price tags that are a far cry from the $20 big box versions but there is a good reason for that. If you are tired of the cheapies holding stock at ever-changing angles that can make it look like a drunk drilled the holes the precision of these Wilton vices become a much better deal. Because they are built to withstand virtually anything up to (and maybe including) a nuclear event the purchase prices should be a onetime expense for the human among us. While the Wilton Drill Press Vises certainly are not bargain-basement items, their actual cost seems surprisingly reasonable for industrial-quality tooling. The Wilton #1206 has a MSRP of $380.00 but we found it on the, street for $310.00. (2-21-2012). The Wilton #1275N carries a MSRP of $920.00 but can be found on the street for around $530.00! (2-21-2012) That is not big money for a lifetime tool that enhances productivity, accuracy and operator safety in virtually any shop or industrial environment.